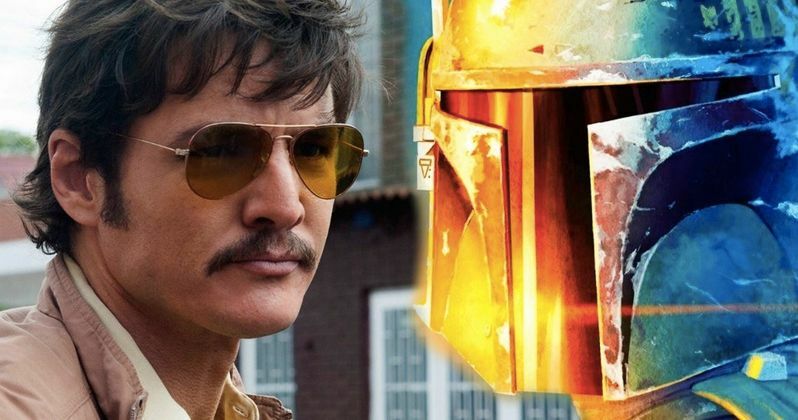 Star Wars TV Show The Mandalorian Gets Narcos Star Pedro Pascal? It looks like we may finally know who will be at the forefront of the upcoming live-action Star Wars TV series The Mandalorian. According to a new rumor, Narcos and Game of Thrones star Pedro Pascal is being eyed as a potential lead for the show, which is being headed up by Iron Man and The Jungle Book director Jon Favreau. Based on what we've recently learned about the series, Pascal would make for an interesting and fitting choice. It was recently revealed by Jon Favreau himself that the series will be titled The Mandalorian. It will take place following the events of Return of the Jedi and prior to the formation of the First Order, who we were introduced to in The Force Awakens. This lone Mandalorian gunman won't be Boba Fett, but will instead be a "new warrior" who it seems will be cut from the same cloth, operating in the outer rim, far from the authority, law and order of the New Republic. Sounds like it basically could be a Bounty Hunter Western in the Star Wars universe. Again, we must caution that this is just a rumor for now. And even if Pedro Pascal is being considered for the lead in The Mandalorian, he may not ultimately be the actor who ends up winning the surely coveted part. That said, he would make for a great choice. Aside from his work on the small screen in HBO's Game of Thrones and Netflix's acclaimed drug cartel drama Narcos, the actor has been making a name for himself on the big screen in Kingsman: The Golden Circle, as well as the upcoming Wonder Woman 1984. Since this series will surely be a cinematic affair, Pascal represents the best of both worlds. With sets currently being built, the first ever live-action Star Wars TV series is getting ready to begin production. Jon Favreau has been busy directing the live-action remake of The Lion King, which is also for Disney, and it looks like he's not taking a moment to breathe as he'll be getting right to work on this, another very high-profile project. The Mandalorian is set to debut on Disney's streaming service, which launches next year and is intended to be a direct competitor to Netflix. This series will be one of the key pieces of content to help attract subscribers. Given that production is just around the corner, we should be getting some sort of official release from Lucasfilm in the very near future regarding the cast and crew who will be working on the series. So if Pedro Pascal is indeed up for the lead role, we should know sooner rather than later. If not him, whoever it is, we'll know soon enough. The Mandalorian does not yet have a release date, but we'll be sure to keep you posted as any new details are made available. This rumor was first reported by Making Star Wars.